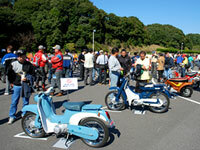 2008 Historic Model Demo Ride and Observation Tour - Communication Plaza | Yamaha Motor Co., Ltd. The restored classic production models are ridden by volunteers from within the company. The volunteers are given pointers about how to look as good as possible on their rides. 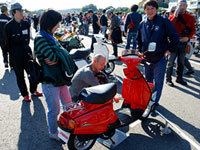 Beginning from 2001, the Communication Plaza has held a yearly “Historic Model Demo Ride Event and Observation Tour.” This year, it was held in magnificent autumn weather on Saturday, November 1st and gathered a crowd of some 1,400 visitors. A total of 610 motorcycles ridden by visitors to the event could be found in the parking area, and both of these figures far exceeded last year’s. Although it was difficult fitting all those motorcycles into the small parking area, we want to thank all of the enthusiastic visitors who came. I just wrote that this event began in 2001, but actually that’s the first year it became an event open to the public. In fact, it began as an in-house event in 1999, the year after the Plaza was opened. Initially, the event was simply a day when the people involved in the restoration work got together and put 20 or so of the machines through their paces on the track and did any repairs or maintenance work deemed necessary. But, such an opportunity to ride or watch historic models like the YA-1 and YDS-1 being ridden was a rare experience, even for most Yamaha Motor employees. So, we decided to solicit volunteer riders from within the company and invite employees and their families or retired employees to come and see the old models in action. It became so popular that we realized it was a shame to limit attendance only to our own employees. That led to the decision to open it to the general public and develop it into a much larger event. Once we decided to make it an open event, we changed the event name from the rather business-like “CP Display Model Running Condition Preservation Ride Event” to the “Restored Display Model Ride Event,” and now the new name “Historic Model Demo Ride Event and Observation Tour.” The event grows in scale every year, not only in the number and variety of models displayed and run but also in the number of company volunteers, organizing staff members and visitors from the general public. Held under blue skies at the exclusive venue of a Yamaha test course, the event now gives visitors the opportunity to see numerous motorcycle models of varying types not normally on display at the Plaza, and the chance to see them being ridden in demo runs. Also, with the large number of Yamaha fans now gathering for each event, it’s possible to see old friends and acquaintances as well as meet unexpected people. This is another big appeal of the event. While the event was originally for running the restored models of the Plaza collection to keep them in running condition, from our standpoint as staff of the Plaza, the event as it stands today is completely in line with the aims of the Plaza’s normal activities and displays. That is, to use a variety of historic products to spread visitor interest in Yamaha Motor and encourage them to love the Yamaha brand even more, while also providing a venue that encourages communication between people of all generations. As for people who have never had the opportunity to visit the Communication Plaza, or the opportunity to take a really good look around it, we hope you’ll come and visit it at least once. We’re certain that it will be an enjoyable experience. After the rather lengthy introduction above, let’s now look at what actually took place at the 2008 “Historic Model Demo Ride Event and Observation Tour.” Befitting the 10th holding of the event (counting from the first closed event in 1999), the number of display models prepared was increased from 42 the previous year to a record 54 models. In the past, the displays centered around epoch-making historic models like the YA-1, YDS-1, XS-1, RZ250 and RZV500R, but with the growing number of newly restored models in recent years, the focus was changed slightly to include a lineup of 250cc 2-stroke sports models and “family bike” models. We were worried that the family bikes might not make very appealing displays, but when we lined them up, it turned out to be quite a colorful assortment. We noticed one man and his wife looking intently at the scooters from the 1980s. When we talked to him, he said that he rode here on a first-generation JOG that a friend had given him. “These models are so nostalgic; they remind me of my younger days,” he said smiling. Crowds formed around the Toyota 2000GT and the OX99-11 as usual, but the crowd’s interest was also drawn to the Toyota Celica 1600GTV that was on display for the first time. This Celica mounting the DOHC, in-line 4-cylinder “2T-G” engine developed and manufactured by Yamaha Motor was one of the representative sports cars of the 1970s and took the car world by storm. The model displayed was restored by employees in Yamaha Motor’s automobile engine production department as part of a workplace personal growth program and is an expression of the company’s desire to hand down important examples of Yamaha products to later generations. While I had been touring the vehicle display area, visitors began to move to the home straight section of the track and line up along it. The people who have been to the event before knew it was about time for the demo runs to begin and they were seeking out a good vantage point to watch the action. 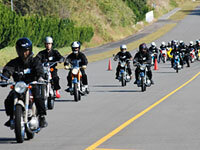 The first models to appear on the track were PW50 mini-bikes ridden by ten youngsters. 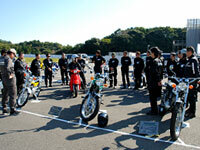 They were making a parade run after finishing the Parent-Child Riding Class held earlier. It was a splendid opening run with the children riding in formation behind a YA-1 at the front. Next, a group of 30 restored production models started one at a time in a parade run behind the lead YA-1 to the warm applause and cheers of the audience. Then the two Toyota cars, the 2000GT and Celica 1600GTV, ran four laps of the test course’s short course together, after which the track was turned over to the OX99-11. Without a doubt, however, the big highlight of this year’s event was the 1978 YZR500 (0W35K) factory machine that powered “King” Kenny Roberts to his first World GP500 Championship title. The rider on it this year was none other than Tadahiko Taira. He rode in a race suit and helmet made just for this event in the yellow and black “Inter-colors” of the day as Roberts had. He commented, “I was also one of the many who looked up to Kenny as the Yamaha ace rider when I was racing. So it is really an honor for me to ride his championship machine.” Mr. Taira set off on his run with a push start in the style of that era and put the machine through its paces in awesome form. At the very end, the final surprise of the event was revealed—the 2008 YZR-M1. The #46 YZR-M1 that Valentino Rossi rode to re-capture the MotoGP Rider and Manufacturer championship titles this season was ridden by Yamaha test rider, Mr. Norihiko Fujiwara. The visitors that had gathered at the side of the course gave an even larger round of applause as the machine went by.